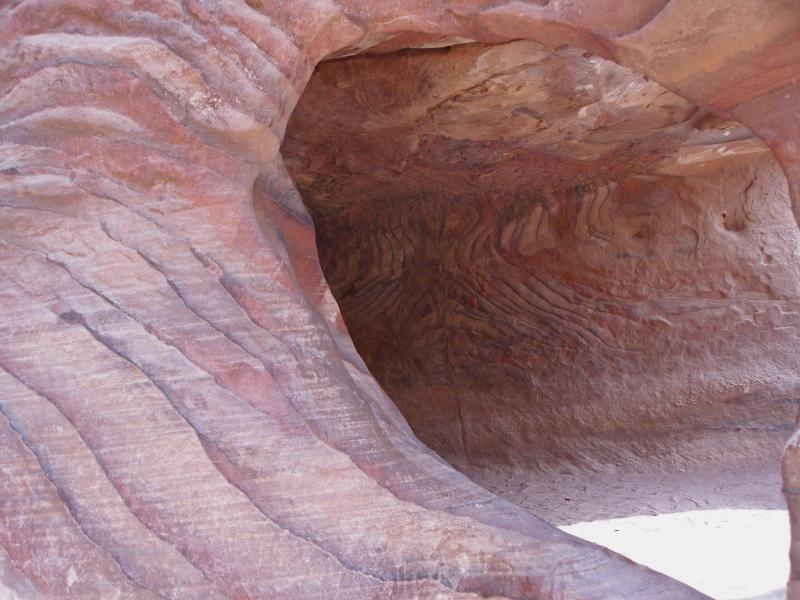 The “rose-red city” of Petra in southern Jordan, famous for its rock-cut monumental buildings, was once the setting for a thriving Christian community with several significant churches. 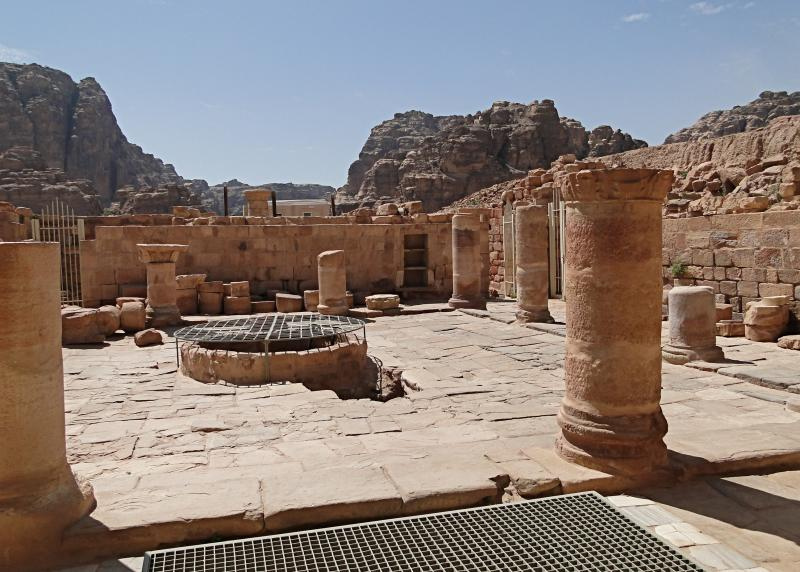 An early account tells of Christians in Petra being martyred during the persecution of emperor Diocletian at the beginning of the 4th century, for refusing to offer sacrifice to Roman gods. Nevertheless, a Christian presence persisted. Bishops from Petra attended Church synods and councils from AD 343, indicating that the city had become a significant Christian centre. Crosses chiselled into sandstone walls show which large tombs were converted into churches. Then a succession of new churches was built. The Roman historian Epiphanius mentions that the conversion of Petra’s residents was a slow process throughout the late 4th and 5th centuries. Then a monk called Mar Sauma arrived with 40 brother monks in AD 423. They found the gates locked against them, but a rainstorm struck with such intensity that part of the city wall was broken, allowing them in. 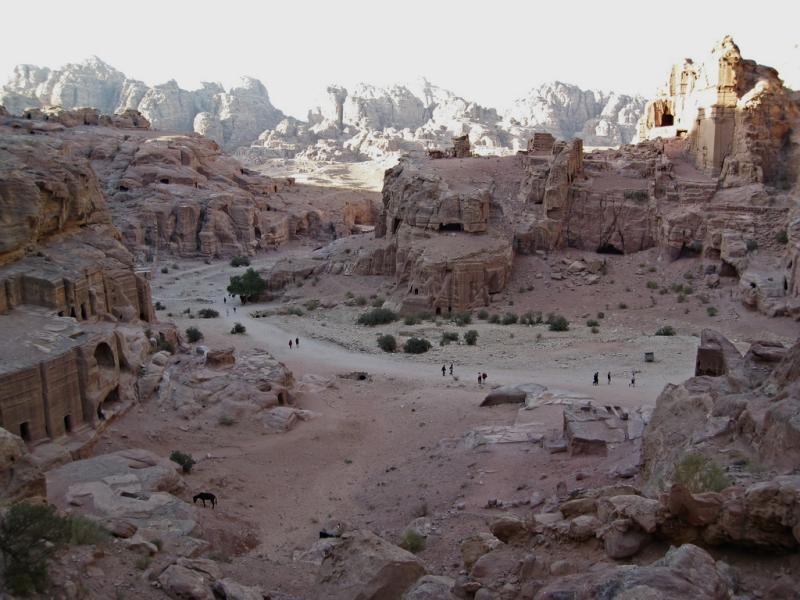 Since the storm had broken a four-year drought, the water-dependent Nabateans saw the event as miraculous and even pagan priests converted to Christianity. 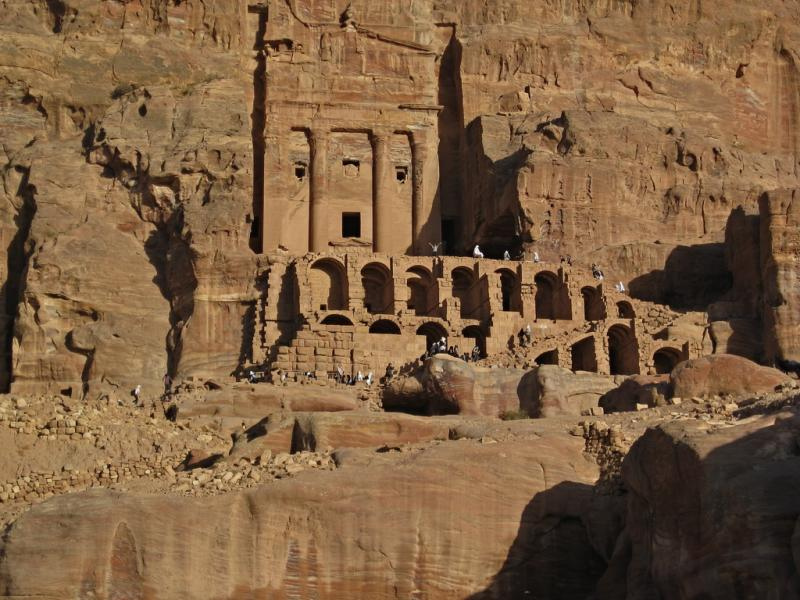 Three churches from the Byzantine era — called the Petra Church, the Blue Chapel and the Ridge Church — have been discovered. They are clustered on the ridge to the north-east of the Colonnaded Street that runs through Petra’s main city area, past the Temple of the Winged Lions. 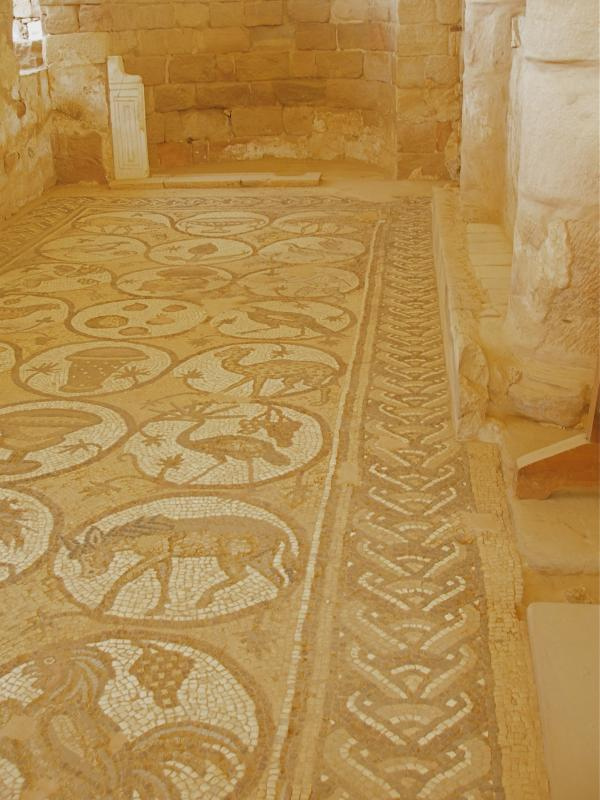 The large triple-aisled Petra Church, a basilica dedicated to St Mary, was probably the ancient city’s cathedral. Little of the interior remains except for well-preserved mosaics carpeting the 70-square-metre floors of each of the side aisles. These depict local, exotic and mythological animals, as well as personifications of the Seasons, Ocean, Earth and Wisdom. The secular nature of these mosaics is probably explained by a reluctance to tread on sacred images. Just west of the church proper is a stone-paved atrium, with a cistern sunk into the centre to catch water. 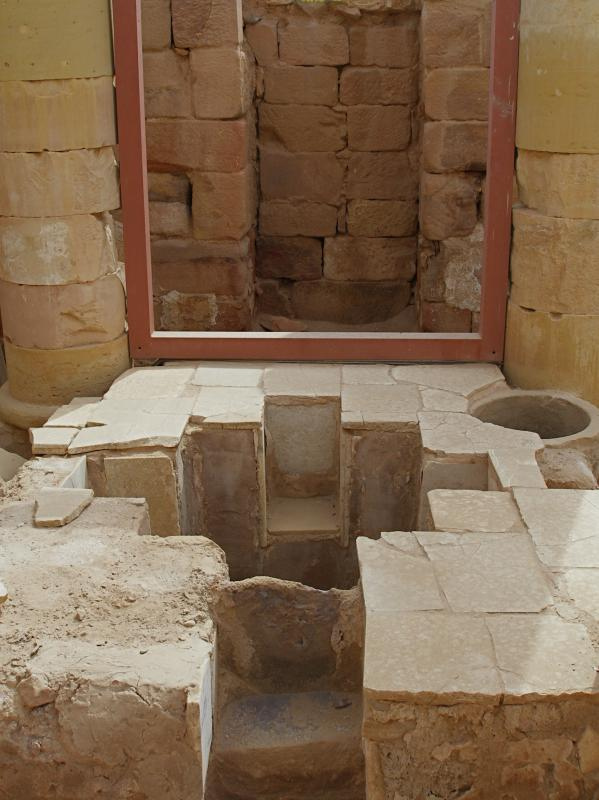 Further west is a baptistery, with a cross-shaped baptismal font. The basilica was destroyed by a fire, probably in the early 7th century. The fire that destroyed the Petra Church also carbonised an invaluable hoard of papyrus scrolls cached in a church storeroom. 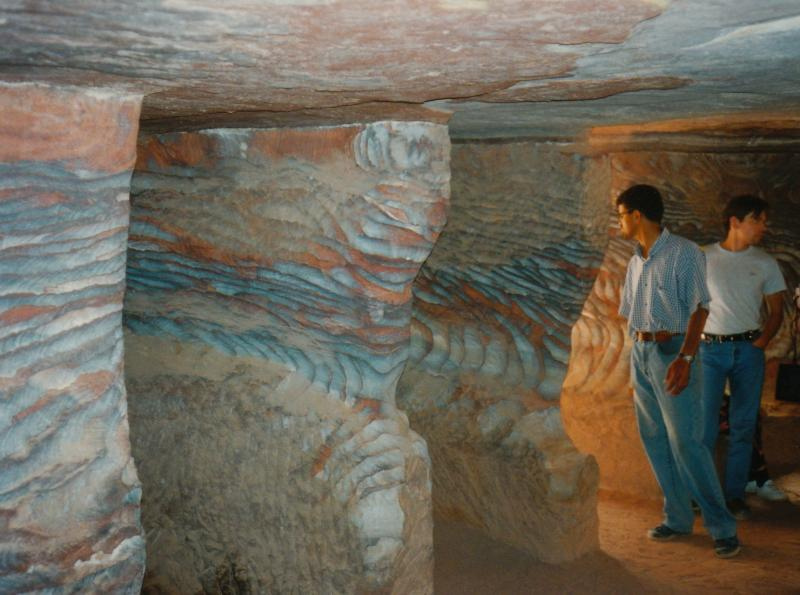 The 152 scrolls — the largest collection of written material from antiquity found in Jordan — lay undiscovered until 1993. Written mainly in cursive Greek, they have been painstakingly deciphered to reveal details of births, prenuptial arrangements, marriages, business deals, wills, properties disputes and tax responsibilities of about 350 members of the community. One of the main figures identified in the scrolls is Theodorus, who married his cousin Stephanous in 537, when he was aged about 24. Later ordained a deacon in the Petra diocese, Theodorus was also a successful landowner with extensive business interests. A son of Theodorus is recorded as being responsible for paying local taxes on a vineyard — at the rate of 47.5 per cent! This affluent family apparently owned much property in the Petra region. 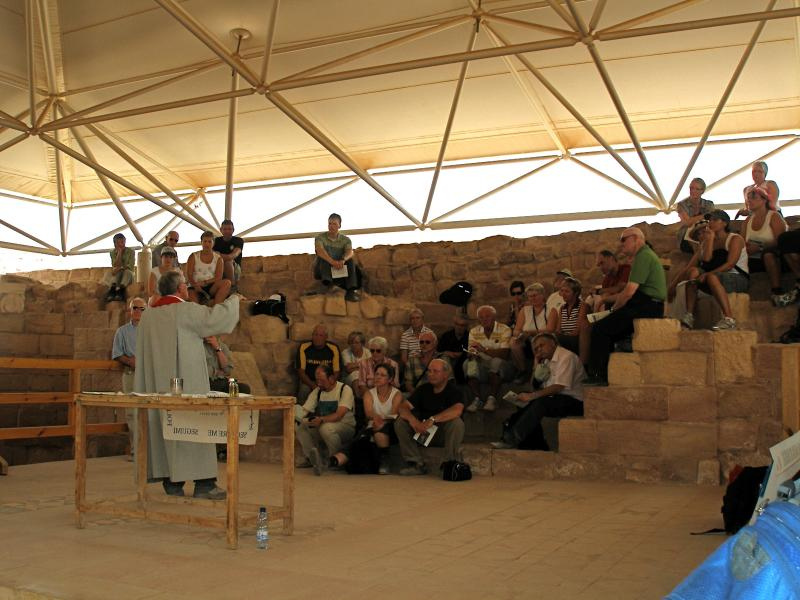 The Ridge Church had a commanding position, with a 360-degree view of the central city, atop the northern slope of the valley in which Petra sits. The oldest church in the city, dating from the 4th century, it had two side aisles separated from the nave by five columns on each side. Behind it, city walls across the valley would have protected Petra against invasion from the north. 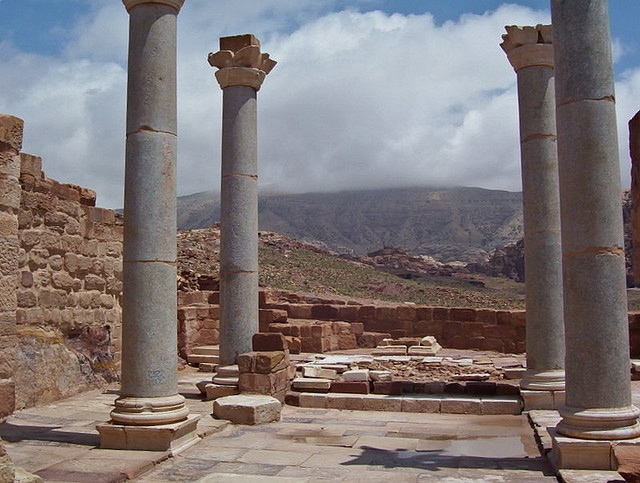 Between the Petra Church and the Ridge Church is the Blue Chapel, so named after its four blue Egyptian granite columns, topped with Nabataean horned capitals, that collapsed in an 8th-century earthquake but have been re-erected. The chapel also had blue sandstone flooring and blue marble furnishings — including a blue marble pulpit. This building is believed to have been converted into a residence and chapel for Petra’s bishop. Other buildings converted to Christian churches include the Urn Tomb and al-Deir (Arabic for “the Monastery”). The Urn Tomb, the first of the four Royal Tombs just north of the amphitheatre, still bears an inscription to “Christ the Saviour” on one of its inside walls. Al-Deir, the biggest and most grandiose monument in Petra, is in the hills overlooking the city from the north-west. A visit involves a walk of about an hour from the city centre, up 800 rock-cut steps. At 50 metres wide and 45 metres high, it is much bigger than al-Khazneh (“the Treasury”) — the famous monument that appears to visitors arriving through the gorge called the Siq (and in which the climax of the 1989 film Indiana Jones and the Last Crusade was set). Originally cut out of the rock to serve as a mortuary temple, al-Deir was apparently later adapted to Christian use. It seems to have acquired its name of the Monastery from the crosses painted and inscribed on its inner walls. Two Greek monks were recorded as living in the building in 1217. In biblical times Petra was a city of the Edomites, whose ancestor Esau settled there after he was tricked out of his rightful inheritance by his twin brother Jacob. Scholars believe Petra was then called Sela. By the middle of the second century BC, the Edomites had been displaced by the Nabataeans. These former nomad herdsmen made Petra their multicoloured sandstone capital city, transforming it into a desert oasis by using ingenious aqueducts and cisterns to conserve water from flash floods. The Nabataeans also controlled trade routes from Arabia to Mesopotamia and Syria, exacting high tolls from caravans which passed their way. One tradition has the Three Wise Men buying their gold, myrrh and frankincense at Petra on their way to Bethlehem. The greatest Nabataean king was Aretas IV (9 BC to AD 40), whose rule extended as far north as Damascus. His daughter Phasaelis was married to Herod Antipas, who divorced her to marry Herodias, his brother’s wife. Aretas IV then marched on Herod’s army, defeated it and captured territories along the West Bank of the Jordan River. In AD 106 Petra was annexed by the Roman empire. Rome’s diversion of the caravan trade and some devastating earthquakes in subsequent centuries put the city into decline. 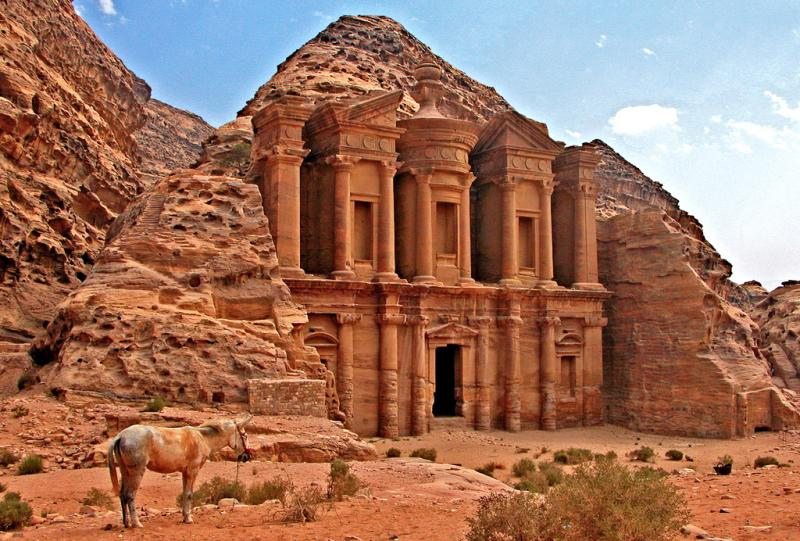 From the 13th century Petra was abandoned. It remained forgotten by the Western world until 1812 when a young Swiss explorer, Johann Ludwig Burckhardt, disguised as an Arab pilgrim, persuaded a local guide to take him there. The poem, published in 1845, ran to 366 lines — much longer than the extract generally offered in anthologies. Far from the Christmas-card image, the place of Christ’s birth is a dimly-lit rock cave. 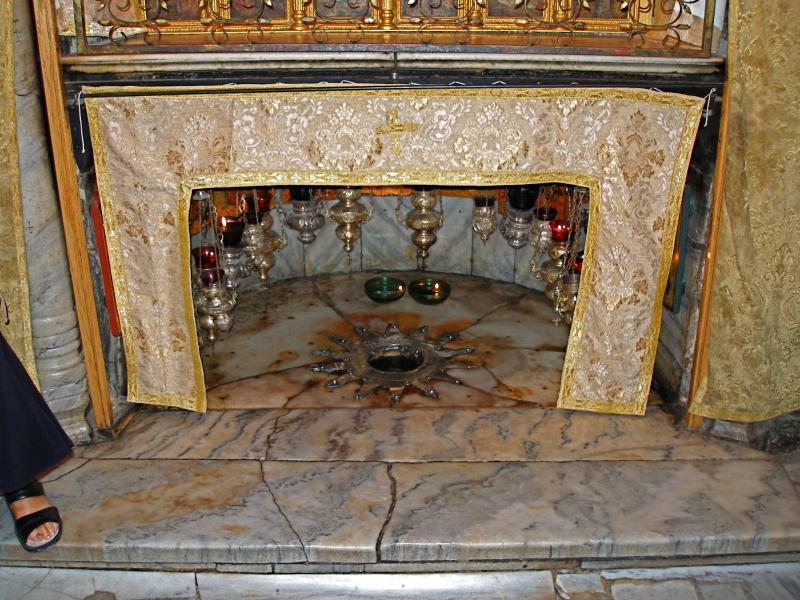 Instead of a star above, a 14-point silver star on the marble floor of the Grotto of the Nativity bears the words “Hic de Virgine Maria Jesus Christus natus est” (Here Jesus Christ was born to the Virgin Mary). Entry is from Bethlehem’s Church of the Nativity. Steps to the right of the iconostasis (the carved screen standing in front of the main altar) lead down to the subterranean cave. Rectangular in shape, the cave measures about 12 metres by 3 metres. Like the church above, it is in the possession of the Greek Orthodox Church. The rough rock of the first Christmas has given way to marble facings and, in the words of biblical scholar E. M. Blaiklock, the cave is “hung and cluttered with all the tinsel of men’s devotions”. On feast days the cave is lit by 48 hanging lamps. Following a serious fire in 1869, three of the walls are protected by heavy leather drapes backed with asbestos. At a slightly lower level is the Grotto of the Manger. 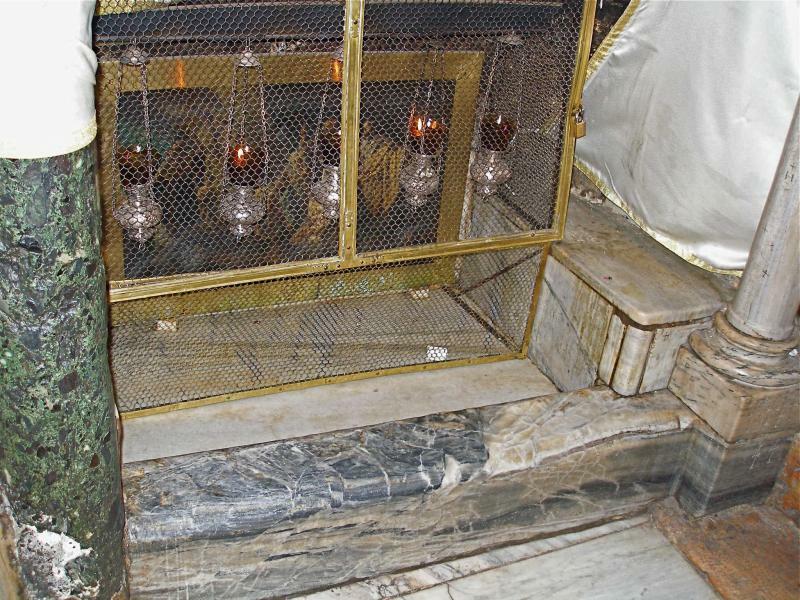 The rock shelf has been covered with marble, but the original rock may be seen around the manger. The dimensions match those of feeding troughs cut into the rock by Bedouins. 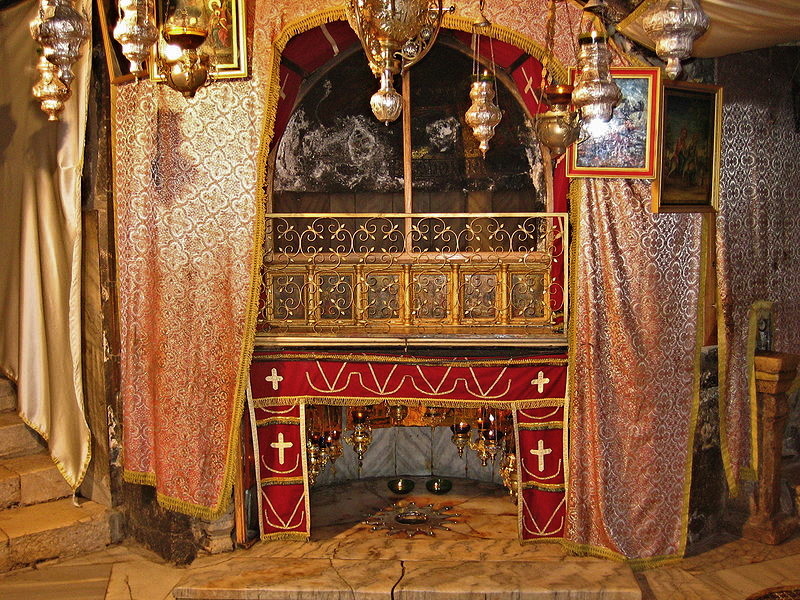 When the original church was built in the 4th century, the Grotto of the Nativity was enlarged to make room for pilgrims and at that time a silver manger was installed. A small altar in the Grotto of the Manger is dedicated to the Adoration of the Magi, the Three Wise Men described in Matthew’s Gospel as coming from the East (probably Persia) to worship the newborn Jesus. This is where the Catholics celebrate Mass. 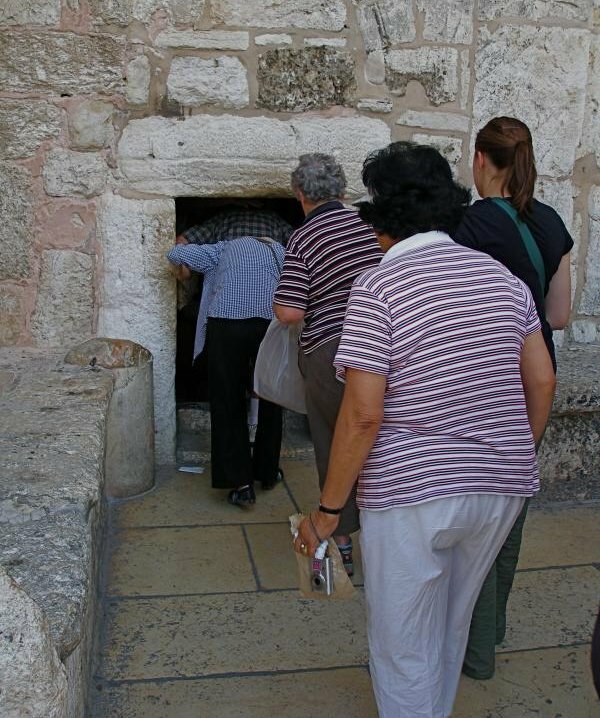 Entering the church that marks the site of Christ’s birthplace means having to stoop low. The only doorway in the fortress-like front wall is just 1.2 metres high. 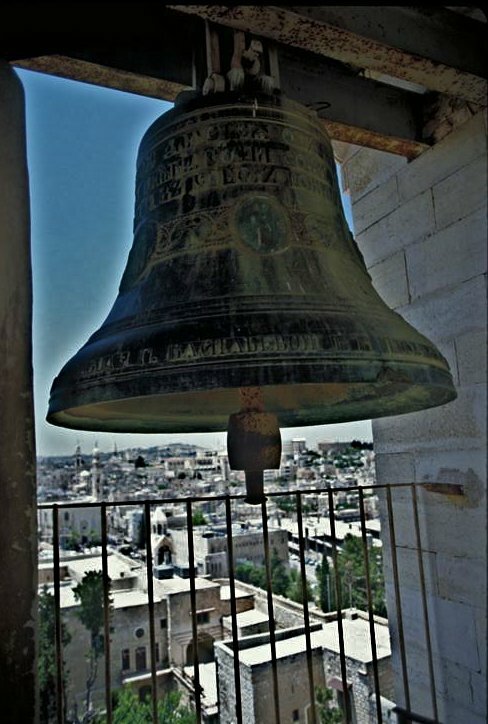 The previous entrance to the Church of the Nativity in Bethlehem was lowered around the year 1500 to stop looters from driving their carts in. To Christians, it seems appropriate to bow low before entering the place where God humbled himself to become man. Today’s basilica, the oldest complete church in the Christian world, was built by the emperor Justinian in the 6th century. It replaced the original church of Constantine the Great, built over the cave venerated as Christ’s birthplace, and dedicated in AD 339. Before Constantine, the first Christian emperor, the Romans had tried to wipe out the memory of the cave. They planted a grove dedicated to the pagan god Adonis, lover of Venus, and established his cult in the cave. The Gospels do not say that Jesus was born in a cave, but there are written references to the Nativity cave as far back as AD 160. Even today in the Judean hills, families live in primitive houses built in front of natural caves used for storage or to shelter animals. When the original Church of the Nativity was built, the cave was enlarged to make room for pilgrims and a silver manger was installed. Persians invaded Palestine in 614 and destroyed many churches. They spared the Church of the Nativity when they saw a mosaic on an interior wall depicting the Three Wise Men in Persian dress. In 1482 King Edward IV sent English oak and tons of lead to renew the roof. In the 17th century the Turks looted the lead to melt into bullets. The roof rotted and most of the rich mosaics on the walls of the nave were ruined. When Unesco put the basilica on its list of world heritage sites in 2012, it was also deemed to be endangered because of damage due to water leaks. A $US15 million restoration of the church’s roof, walls and mosaics began in 2013. 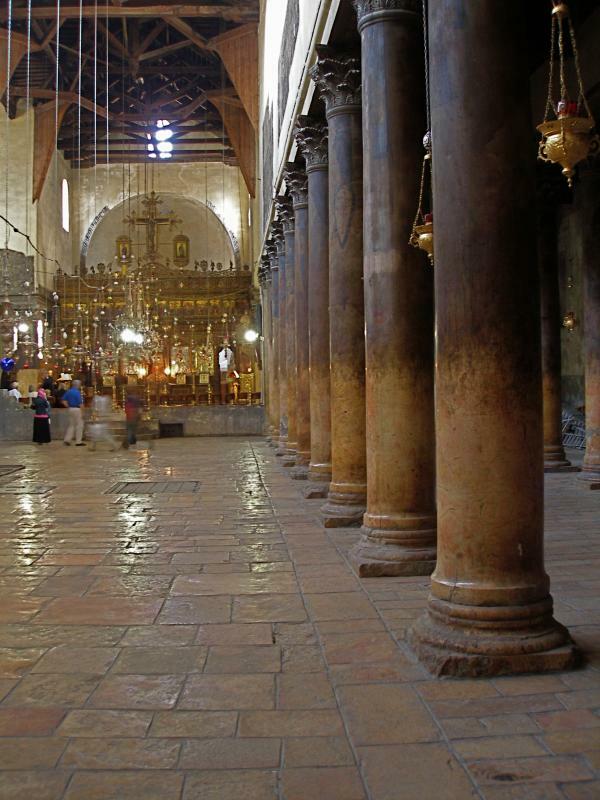 Today’s Church of the Nativity is cool and dark, its interior bare with no pews. Wall mosaics from the 12th century — depicting saints, angels and Church councils — have had their original sheen restored. The restorers even uncovered a 2-metre mosaic of an angel that had been lost for centuries. Trapdoors in the floor allow glimpses of the mosaic floor of Constantine’s basilica. The red limestone pillars were quarried locally. Many are adorned with Crusader paintings of saints. Steps to the right of the iconostasis (the carved screen, adorned with icons, that stands in front of the main altar) lead down to the Grotto of the Nativity. As the ornamentation, icons and lamps in the front of the church suggest, the basilica is now almost wholly a Greek Orthodox place of worship. The Armenian Orthodox own the northern transept. The Catholics have the site of the manger and the adjoining altar next to the Nativity grotto. So while Christians in the Western world celebrate Christ’s birthday on December 25 of the Gregorian calendar, the church at his birthplace still has 13 days to wait for the Orthodox, using the old Julian calendar, to celebrate it on January 7. Then the Armenians celebrate Jesus’ birth and baptism together on January 19. So where does the televised Christmas Eve service on December 24 come from? The adjoining Church of St Catherine of Alexandria, which is Catholic. The West Bank city of Bethlehem, about 9km south of Jerusalem, is celebrated by Christians as the birthplace of Jesus Christ. Here Mary gave birth in a cave used for animals. Here the local shepherds came to worship the baby, and here the Three Wise Men from the east came to pay homage and present their gifts. Here too, 1000 years before Christ, Bethlehem was the birthplace of David, Israel’s second king. Here David was anointed as king by the prophet Samuel after being brought in from tending his father’s sheep. The city of Bethlehem (in Hebrew its name means “house of bread”) perches on a hill at the edge of the Judaean desert. Bedouin from the desert rub shoulders with pilgrims and tourists among a mix of cultures in its town market and its narrow, ancient streets. The cave where the birth took place and the manger stood can now be visited underneath the huge Basilica of the Nativity. This is the oldest complete church in the Christian world. During the 20th century, Bethlehem was controlled in turn by Turkey, Britain, Jordan and Israel. Hostilities led to thousands of displaced Palestinians living in official refugee camps nearby. In 1995 Bethlehem came under the administration of the Palestinian Authority, though Israel retained control of entrances and exits. During times of Israeli-Palestinian conflict, the city has seen many confrontations. Israel’s construction of the separation wall has severely affected Bethlehem’s economy and the movements of its residents. The barrier runs along the city’s northern side, within metres of houses. Because of Christian emigration, Bethlehem now has a Muslim majority. The Mosque of Osmar is a prominent landmark. The remaining Christians include Latin, Syrian, Melchite, Armenian and Maronite Catholics; Greek, Syrian and Armenian Orthodox; and a variety of Protestant denominations. Many religious institutions are present, including Bethlehem University, founded under the direction of the Vatican. Maintaining the Christmas spirit, Franciscan friars daily celebrate the Eucharist in the Grotto of the Manger and at noon perform a procession around the holy places. 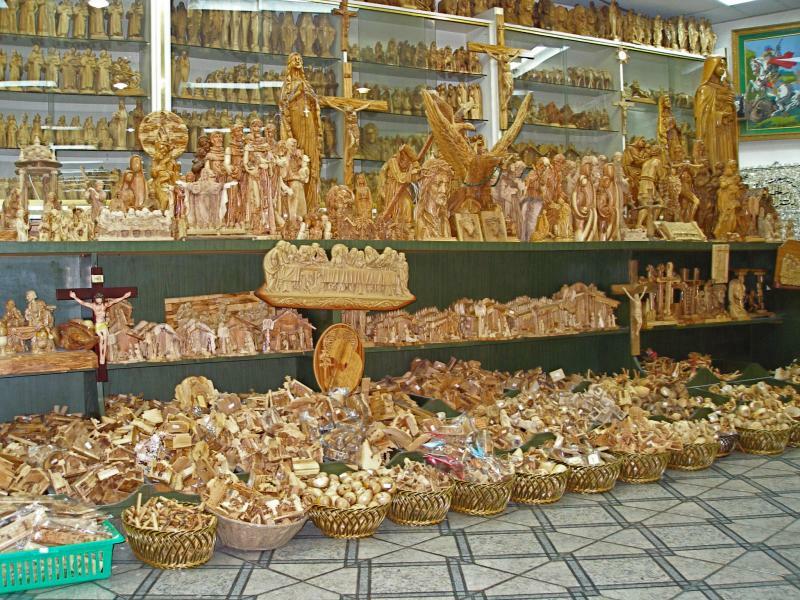 Bethlehem’s residents, who depend largely on pilgrims and tourists for their livelihood, are known for their olive wood carvings, mother-of-pearl jewellery (a craft introduced by the Franciscans) and distinctive embroidery. Joseph, Frederick: “Bethlehem”, Holy Land, winter 2002. Petrozzi, Maria Teresa: “The Nativity Grotto”, Holy Land, winter 1997. Shenton, Della: “Go now to Bethlehem”, The Tablet, London, December 16, 2006.